To America’s Democrats and Socialists: IT’S TIME TO STAND DOWN! On Saturday, October 7, a long, bitter, and politically polarizing battle in the U.S. Senate ended. The confirmation of Judge Brett Kavanaugh was interrupted at the eleventh hour by Democrats on the Judiciary Committee, who revealed an explosive accusation of sexual misconduct from more than 30 years ago. Although the allegation was uncorroborated and unprovable, that did not prevent the Democrats from turning the hearings into a spectacle of massive proportions. The confrontation only ended when Kavanaugh was confirmed by a solid Republican vote of 50-48 to become Associate Justice on the U.S. Supreme Court. The six grueling weeks of testimony and the FBI investigation that followed, were fodder for bitter and ugly accusations, and divided the nation in a way not seen for decades. To make matters worse, the acrimony did not end with Justice Kavanaugh’s swearing in. It barely took a breath. Historically, the most bitter fights between political parties during elections have ended once the vote has been tallied and the race decided. 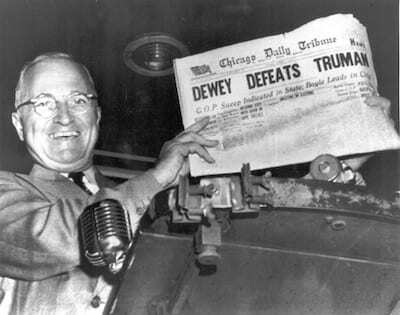 When Harry Truman won an unexpected victory over Thomas E. Dewey in 1948, the nation was shocked, but then went back to its business very quickly. When John F. Kennedy won a bitter contest against Richard Nixon, disappointed Republicans quickly turned back to their old routines and life went on. But today the dynamics are different. The demonstrations of modern political animus began in the 2000 presidential elections, when George Bush won the Presidency over Democrat Al Gore by only five electoral votes in Florida. While there was ample evidence of irregularity in the Florida voting process, the Supreme Court decided that a recount could not be accomplished and it ended the tallying. The Democrats continued to complain about the loss to Bush, who, they said, “stole” the election. When Barack Obama won his first election in 2008, there was deep disappointment in the Republican camp, but it did not result in mass demonstrations and disruptions. The Tea Party movement, a loosely knit group of fiscally conservative Americans, had a short-lived role in organizing peaceful demonstrations around the country to support a conservative agenda, but by 2012 it had all but disappeared. The response of Democrats to their losses at the polls was far different. From the cries of ‘stolen election’ in 2000 that continued to reverberate for over a decade, it was only a short walk to the evening when Hillary Clinton won the popular vote, but lost her 2016 bid for the White House by a large margin in the electoral college. The rage felt by the Democrats had been inflamed by the huge changes that Donald Trump brought to the election process as well as the changes he promised to bring to the country, and Democrats continue to blame everyone but Clinton herself for her loss. Even during the presidential campaign, the country was a scene of eruptions of violent reaction to a variety of triggers. Students on college campuses reacted to Trump supporters with the demand for “safe spaces” to protect them from the discomfort of dealing with opinions different from their own. The riots in Ferguson, Baltimore, and Charlottesville were further signs that the frenzied opposition to Donald Trump would not die down anytime soon. The Kavanaugh hearing was only the latest trigger, but it signaled a new level of frenzied hate and lawlessness. Once the confirmation hearings were over and Justice Kavanaugh had taken his seat on the Supreme Court, the vitriol should have died down. We should all have accepted the decision of the Senate, and we should have moved on. That is the way America has always worked. But not this time. The echo of the ayes and nays had scarcely died down, when Democrats began signaling that the fight was far from over; they immediately began talking about impeaching the new Justice. The demonstrations, the accusations, and the raging anger of the left not only continued, but got worse. The picture of hysterical young women, crying and screaming as they beat at the doors of the Supreme Court in an attempt to disrupt Kavanaugh’s swearing-in ceremony, was a pathetic and sad commentary on the direction America is going. This is not longer politics as usual. It is a signal of a war that divides us on the basis of skin color, gender, political beliefs, and religion. And it continues. Minority Leader Nancy Pelosi (D-California) fired the first salvo. She called the FBI investigation into question and announced that she would file a Freedom of Information Act (FOIA) request for the release of the classified FBI report. Senator Maize Hirono (D-Hawaii) made the rounds of Sunday morning talk shows, where she blasted Republicans for their support for Kavanaugh and their disregard for the uncorroborated claims of Dr. Christine Ford. Heidi Hess, co-director of the liberal group CREDO Action, which had been actively involved in harassing Republican senators during the hearings, launched a petition that she claims reached more than 125,000 signatures . The petition is short and to the point. According to Hess, “accused” means “guilty”, end of discussion. It ignores the time-honored concept of “innocent until proven guilty” and finds Kavanaugh guilty without proof or evidence. Missing in all these angry responses to Justice Kavanaugh’s confirmation is any reference to the rule of law or the concept of “innocent until proven guilty”. With the enthusiastic backing and financial support of billionaires like Tom Steyer and George Soros, demonstrators are still in the streets, screaming slogans against Kavanaugh’s appointment, and aligning themselves with survivors of sexual assault. Fear, anger, intimidation, and despicable accusations are the new weapons of the political left. It is an increasingly strident and vicious voice that has taken hold of the country and driven deep wedges between Americans on the right and left. Barbs, Bats, and Bullets: What’s Next? Our country has been hijacked by a radical movement that enjoys hating America, and thinks socialism is a good idea. The movement is populated by an “entitled generation”, young men and women who believe that they are entitled to everything that previous generations spent their lives working for. As children, these young Americans received awards for ‘participating’. They were taught that there are no winners and losers, that rather they are all winners. They learned about gender equality, but failed to learn to think critically. They learned about ‘fairness’ but were not taught history, or philosophy, or political theory. And they feel unsafe in the presence of opposing opinions. Now, as young adults, they think they are entitled to feel ‘safe’ and to be free from having to deal with ideas that are different from their own. They want the ‘free stuff’ that self-described socialists offer: “free stuff” to which they think they are entitled. And they want the rest of us to pay for them, even though the candidates themselves who offer them don’t seem to have figured out how. America is facing with an uprising of gigantic proportions that is challenging the norms of American life, norms that shaped our nation and created the great society that provided a light to the rest of the world for two hundred and forty-two years. Clinton was wrong on all counts. Republicans do not respect what she called ‘strength’. Republicans call it what it is: bullying, smearing, character assassination, and violence. Republicans feel anything but respect for those who use these tactics to gain power. Time was when we could sit down together and talk about the issues, and find areas where we agreed and where we disagreed. The conversations could be civil, and we could remain colleagues and friends. Today, the blind outrage on the left has made civil discourse nearly impossible. Stop. Take a breathe. And stand down. Understand that the folks on the other side are just as passionate as you. And the stakes could not be higher. Because the future of our country – yes, I said our country – is at stake. Our visions of what America should be are diverging, and the rage that was kindled after the Presidential elections of 2016 is flaming hotter every day. We are engaged in a battle of conflicting concepts of what America should be. That is all the more reason why finding a way to engage in civil discourse is essential, now, before it is too late for conversation. The civilized way to deal with the conflict is to talk, negotiate, deliberate on what the consequences of policy may be. The left seems to be moving away from the traditional forms of American democracy and towards a society based on socialist principles. The right is moving towards a stronger acceptance of Constitutional law. The right believes the left is wrong and points to Venezuela as an example of where socialism goes wrong. The left believes that the right is evil and blames “white privilege” and “white male power” for the sins of this country. The left is angry because the right won the 2016 election. The right feels betrayed by the left’s unwillingness to accept the results, as we have for overtwo hundred years. It is time for all Americans – Democrats, Republicans, Liberals, Conservatives, Libertarians, Socialists, and everyone else – to recognize that the nation that gave us all the right to express our opinions freely is now on the verge of a civil war that, once ignited, will be difficult to stop. It is time to stand down and allow the raging fury to cool down. It is time for right and the left to sit together and create a new way to communicate our frustrations and disagreements, and to resolve our issues. Abraham Lincoln said, “A house divided against itself cannot stand.” It is time for Americans to begin the difficult process of healing our wounds, before it is too late.